You will get the latest 10 iPhone ringtones released and at least two new ringtones every Tuesday for as long as you are subscribed - $1.98! Sign up for a year and get instant access to all the great iPhone ringtones we have ever produced at no extra cost (more than 300 tones) and you will get two new unique iPhone ringtones every Tuesday - only $23.76! 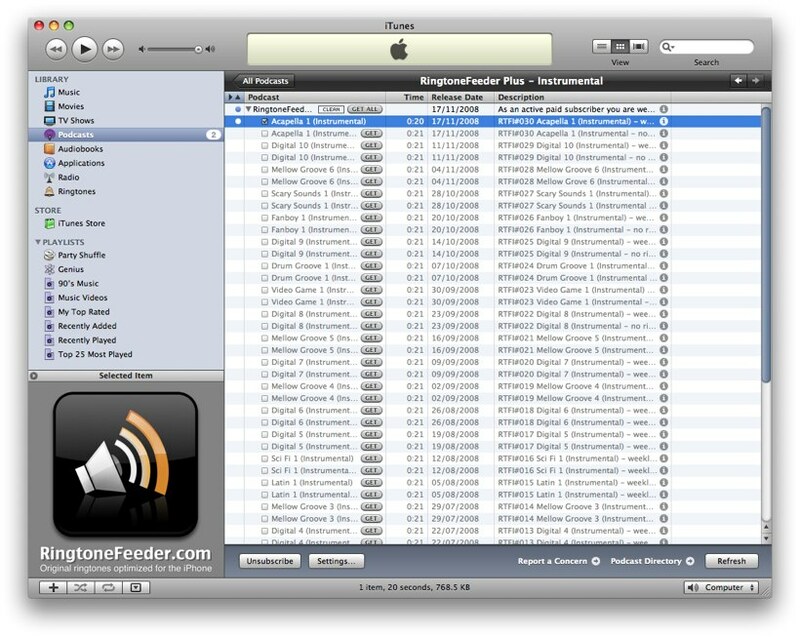 Launch the iTunes app on your iPhone, search for "RingtoneFeeder" to buy and install any ringtone straight from your iPhone. 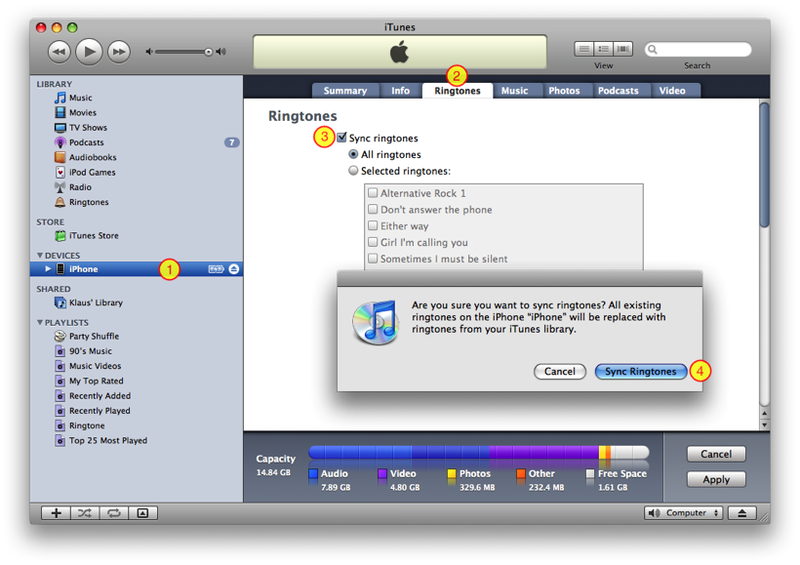 There has been a change in how ringtones are handled in iTunes as of version 10.4 and later. The ringtones now only show up when your iPhone is connected to iTunes and you click the iPhone device and then the Ringtones tab. There you can select "Sync all ringtones" or just the ones clicked. This is also the case with the iOS5 and iTunes 10.5 using WiFi syncing. Please make sure you have the latest iPhone firmware installed (minimum version 1.1.3 or later) and the latest version of iTunes minimum 7.6 or later. 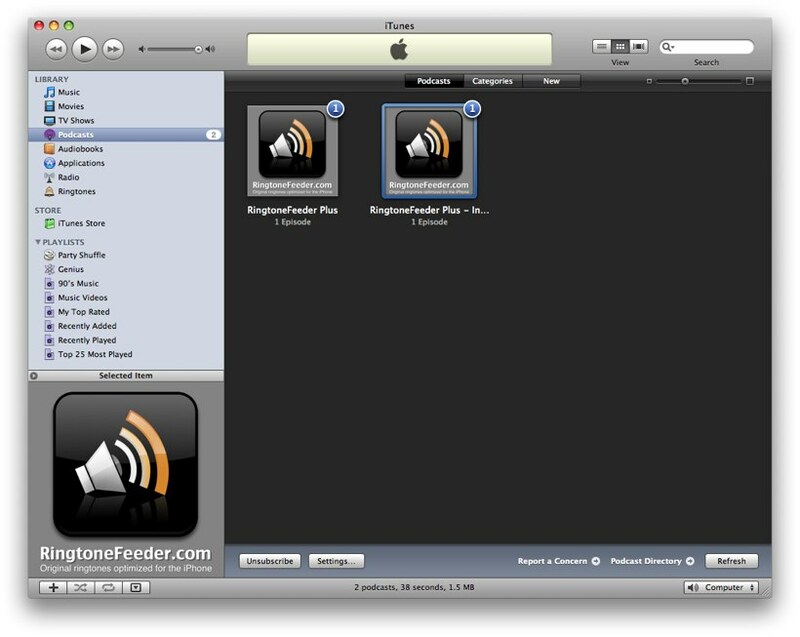 RingtoneFeeder works with iTunes 8,9 and 10 as well as the iPhone 4, 3G, 3GS and first generation iPhone with 2.0 and all the way up to iOS5. Hacking or jailbreaking is not required for iPhone ringtones to work and playlists will work with all supported languages and in all countries - including those where ringtones from iTunes is not yet offered. Your feed will always be available at the subscribers section under the heading "Your Subscriptions". 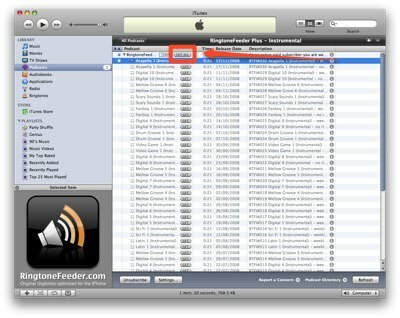 Just click the relevant link to start the download of your content in iTunes. You can also download individual files from the Download section. I can't see any Ringtones folder in iTunes? How do I sync all the ringtones to my iPhone? My username/password stopped working in iTunes? 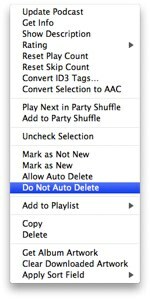 What if I delete the feed from iTunes? How do I backup my ringtones? If I cancel my subscription, will I loose all the ringtones? 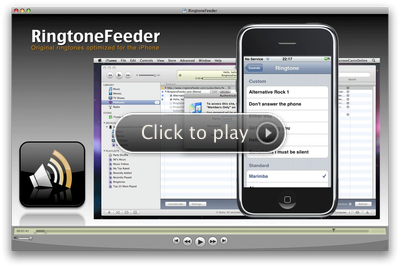 Why do you only offer RingtoneFeeder for the iPhone? I did not get any welcome email? What if I purge my podcasts automatically? What does the exclamation mark in iTunes mean? How do I upgrade from monthly to annual subscription? Why can't I upgrade to RingtoneFeeder Plus? Why am I am not receiving the weekly ringtones? I can't hear the RingtoneFeeder tones on my iPhone? Please get in touch with us if your question has not been answered on this page and we will do everything we can to help you out. Select the Ringtones tab and tick "Sync ringtones"
Confirm by clicking "Sync Ringtones"
If you want to keep specific ringtones on your iPhone permanently even if you delete the podcast feed or simply want to back them up outside of iTunes, you can always download the latest 10 releases for as long as you are an active subscriber. If iTunes suddenly prompt you for your username and password and it no longer works after you have successfully received the paid subscription feed at least one time, chances are your subscription has expired. You can check your current subscriptions from the Subscribers section. If you do not see an active monthly or annual subscription under "Your Subscriptions" then that is the reason for the prompt in iTunes and you need to add a new monthly or annual subscription from the Subscribers section. 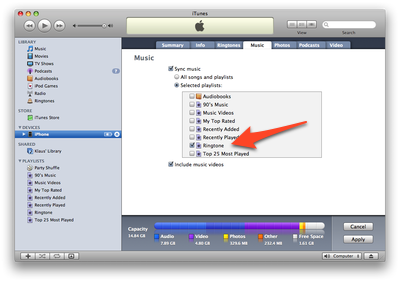 If you do have an active subscription and have copied your iTunes directory to a new location, restored from a backup or deleted your cookies for example you might also be prompted for your username/password. If the combination is not working you might have forgotten your credentials. You can request a password reset from the "Lost password?" section and enter the new username/password combination to solve the problem. If you have cancelled your subscription you can just go ahead and delete the "RingtoneFeeder" Podcast from iTunes to stop the username/password prompts. Please note the ringtones currently in the feed will also be removed from iTunes as well as your iPhone unless you click "Keep file". In any event make sure you have a backup before deleting the feed if you want to keep the ringtones. Note: If you clicked "move to trash" by mistake your ringtones will most likely still be available in your Trash. 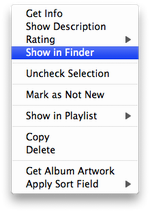 Mac In iTunes right-click on the ringtone you want to backup and select "Show in Finder" and then drag the ringtone file to a backup folder while holding down the Option ⌥ key and the file will be copied across. Make sure you hold the Option ⌥ key as you would otherwise move the file instead of copying it. Windows: in iTunes right-click on the ringtone you want to backup and select "Show in Windows Explorer" and then right-click the ringtone file and drag it to a backup folder. When you let go of the mouse-button select the "Copy Here" option. We strongly recommend that you have a proper backup of your entire system in which case such backup location should also contain a copy of your ringtones. No, the ringtones you have received during your active subscription are yours to keep, but make sure you make backup (see above) as you will not be able to download the tones again. Please note: The only way you can loose your ringtones is if you delete the feed from iTunes, to stop the prompt for username/password for example, and click the "Move to trash" button - if you want to the riingtone, make sure you select the "Keep file" option. We have initially chosen to focus on the iPhone partly because we really like the iPhone as a phone and partly because it is far easier to manage development when you just have to support a single device. We have received numerous requests about support for other handsets and it is something we are looking into, but we do not believe in just converting the existing tones to mp3 or wma - we want to make sure the ringtones sounds great before we offer support for other devices. Although this is not a frequently asked question, we thought it would appropriate to list the procedure anyway. Under Payment History - click "Cancel"
Finally please note that we do not offer any refund. Your subscription will therefore be valid for the period you have paid for and access to the ringtone feed will stop only at the end of the current billing cycle. We have had a number of requests from various countries about setting up Smart Playlists in different languages so we have attempted to compile a list of how the settings should look like in some of the languages supported by iTunes. Please let us know if we have missed out on a language or if you have any problems getting it to work. If you did not receive your welcome email containing your account information and payment details, please make sure you check your spam filters as it might have arrived there. To make sure you receive email messages from us to your inbox in the future, please make sure that you add *@ringtonefeeder.com to your address book or white list filters. Your feed links will always be available at the subscribers section under the heading "Your Subscriptions". Just click the relevant link to start the download of your content in iTunes. Some users have their podcasts automatically purge after listening to them and would like to move the ringtones from podcast to music once received. The easiest way to do that is to download the ringtones you want to keep. Once the files are downloaded to your computer you need to double-click each one of them to automatically copy them to the Ringtones folder in iTunes where they will remain even if you delete the podcast feed. 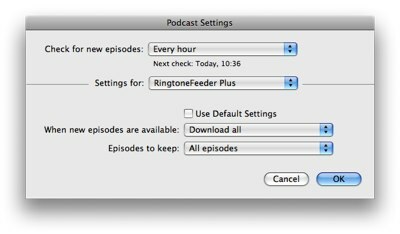 If you would like to keep all the ring tones in your podcast feed you can override the global settings by right-clicking the RingtoneFeeder Podcast and select the "Do not Auto Delete" as illustrated on the right. iTunes was not able to connect to the RingtoneFeeder server when checking for updates. Make sure you are connected to the Internet and then hit the "Refresh" button in the right-hand lower corner in iTunes. It could just be a temporary connection issue and if so just try again a bit later in any event iTunes will automatically attempt to connect again based on your update settings. If you double-click the exclamation mark and get the message that iTunes has stopped updating the podcast as illustrated below it is because you have not listened to the recent episodes / ringtones recently in iTunes. Simply click "YES" to resume updating and you will receive the latest iPhone ringtones. First go ahead and cancel your monthly subscription which will stop the monthly recurring charges by PayPal. Once the cancellation is completed, go to the Subscribers section and select the the Annual subscription and hit the Order button - the remaining time you have from the existing monthly subscription will automatically be added once you have completed your annual subscription. 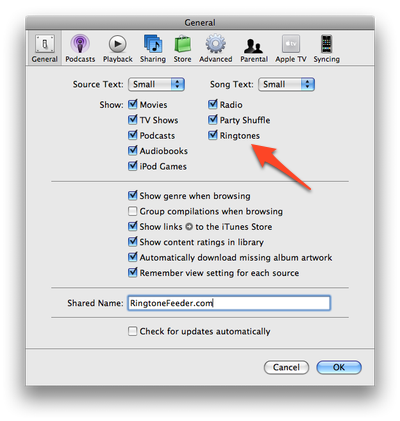 In iTunes 8 only the first item is downloaded when you first subscribe - the following steps will ensure all the ringtones are automatically downloaded and kept on your machine. 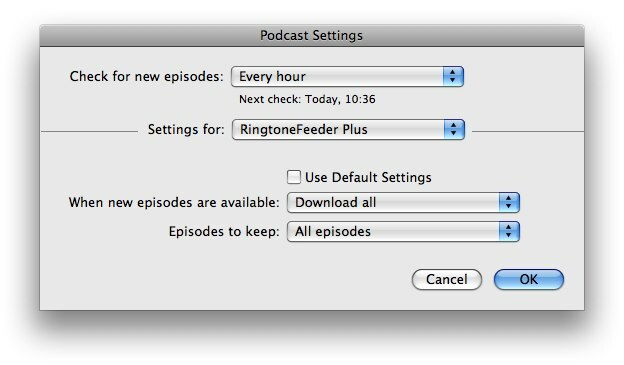 Once the Podcast has downloaded you will see the RingtoneFeeder logo assuming you are using the default settings in iTunes as illustrated below - you can get to the list view simply by double-clicking the RingtoneFeeder logo. Once you have changed the settings, you can go back to the list view and click the "GET ALL" button to download all the ringtones available to you at the moment and in the future you will automatically receive the new ringtones every Tuesday. © 2008-2013 RingtoneFeeder. All rights reserved.